CSR Performance Products has offered high quality, American-made performance products since 1989. Pit Stop USA is The Online Motorsports Superstore! CSR Performance Products have been manufacturing high quality, American-made high performance products since 1989. 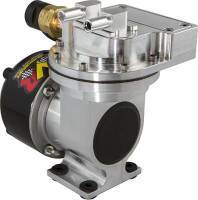 The product line consists of water pumps, cooling products, starters, accessories, transmission shields and more. CSR Performance Products continually strive to add new durable, high quality performance products. CSR Performance Products Platinum Pro-Series Starters are designed for all-out competition use. These starters are recommended for ALL engines greater than 450 cubic inches and/or which have compression ratios over 12.5:1 and/or are supercharged. CSR Performance Products Platinum Pro- Series Starters utilize a powerful 2.6 hp Starter motor that provides 40% more torque than CSR Performance Products 1.9 hp Mini High Torque Starters and are only 8.5" long from the center of the mounting hole to the end of the starter to allow for maximum clearance. CSR Performance Products offers the ultimate in high torque gear reduction competition starters that have been race proven from large cubic inch racing engines to street cars. CSR Performance Products starters are the most dependable, reliable and trouble free starters on the market, designed to meet the most rigorous demands of todayas competition engines. Recommended application 450 CI and under with 12.5:1 compression ratio with 1.9 hp. CSR Performance Products Swivel Thermostat Housings are CNC machined of 6061- T6 Billet Aluminum. Available in multiple choices of hose connections and will swivel a full 360 Degree for easy connection in any position. The flange is sealed at the manifold with an O-ring, eliminating the gasket. - Stainless steel bolts included. CSR Performance Products Water Pump Spacers are CNC machined from 6061-T6 Billet Aluminum. All CSR spacers are machined for o-rings on both sides. Use with belt drives and front mounted distributors. O-rings included, bolts not included. We feature CSR Performance Products at low everyday prices!